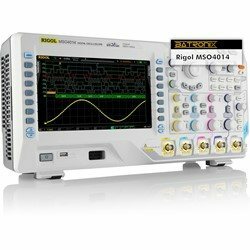 MSO4000 Rigol Oscilloscopes ! !Special Offers!! 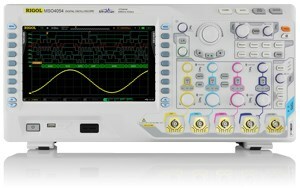 All models of the MSO4000 provide a sample rate of 4 GSa/s, 140 Mpts memory(! ), a 9” (22,9 cm) TFT-color display, as well as professional measurement and mathematical functions and an additional built-in 16 channel logic analyzer. The devices are available with 2 and 4 built-in channels and have 4 bandwidth variants each (100, 200, 350 and 500 MHz). 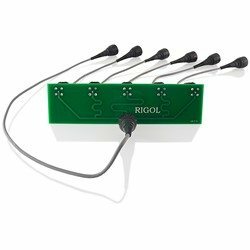 Rigol alternatively offers the DS4000 series without the additional built-in 16 channel logic analyzer. Attention: All DS/MSO4000 are equipped with a new fan which is much more quiet than before! The MSO4000 Oscilloscopes can be upgraded with decoding functions (RS232, I²C, SPI, CAN, FlexRay) and advanced trigger options (Windows, Nth Edge, Video / HDTV, Delay, TimeOut, Duration und USB) by entering a serial code. Rigol offers three upgrade options for both, DS models (Digital Storage Oscilloscopes) and MSO models (Mixed Signal Oscilloscopes) of the 4000 Series. It is mandatory that the latest Firmware is installed. 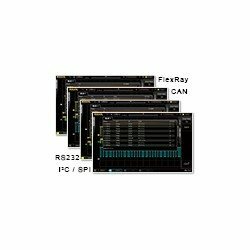 High quality 4 channel DSO with 100 MHz bandwidth, 4 GSa/s and 140 Mpts memory depth, with integrated 16 channel logic analyzer with digital sample rate up to 1 GSa/s and 28Mpts memory depth per digital channel. 4 probes RP3500A (bandwidth 500 MHz), logic analyser cable with 16 logic probes, USB cable, power adapter and quick manual. High quality 2 channel DSO with 200 MHz bandwidth, 4 GSa/s and 140 Mpts memory depth, with integrated 16 channel logic analyzer with digital sample rate up to 1 GSa/s and 28Mpts memory depth per digital channel. High quality 4 channel DSO with 200 MHz bandwidth, 4 GSa/s and 140 Mpts memory depth, with integrated 16 channel logic analyzer with digital sample rate up to 1 GSa/s and 28Mpts memory depth per digital channel. High quality 2 channel DSO with 350 MHz bandwidth, 4 GSa/s and 140 Mpts memory depth, with integrated 16 channel logic analyzer with digital sample rate up to 1 GSa/s and 28Mpts memory depth per digital channel. 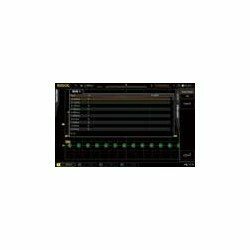 High quality 4 channel DSO with 350 MHz bandwidth, 4 GSa/s and 140 Mpts memory depth, with integrated 16 channel logic analyzer with digital sample rate up to 1 GSa/s and 28Mpts memory depth per digital channel. 4 probes RP3500A (bandwidth 500 MHz), logic Analysator cable with 16 logic probes, USB cable, power adapter and quick manual. High quality 2 channel DSO with 500 MHz bandwidth, 4 GSa/s and 140 Mpts memory depth, with integrated 16 channel logic analyzer with digital sample rate up to 1 GSa/s and 28Mpts memory depth per digital channel. 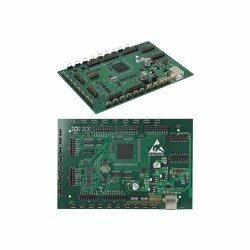 High quality 4 channel DSO with 500 MHz bandwidth, 4 GSa/s and 140 Mpts memory depth, with integrated 16 channel logic analyzer with digital sample rate up to 1 GSa/s and 28Mpts memory depth per digital channel. Promotion Offer! Buy all MSO/DS4000 signal decoder options for the price of a single option! 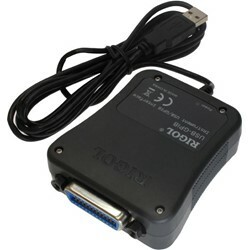 The T2R1000 active probe adaptor can be used to connect the TekProbe - BNC level II probe with RIGOL DS6000 series or MSO4000 / DS4000 series digital oscilloscope. 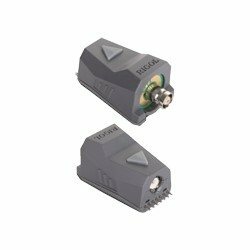 It converts the TekProbe - BNC interface to RIGOL - Probe interface and supplies power, calibration and DC offset adjustment function for the probe. 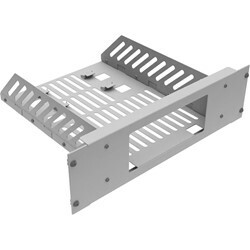 Rack Mounting Kit to mount the Rigol DS4000 series oszilloscopes in a 19" rack.